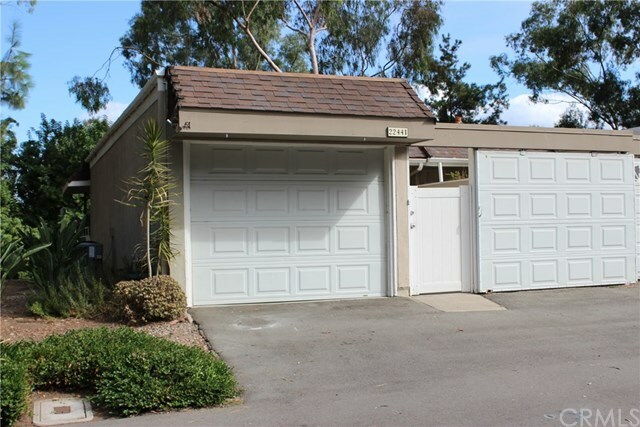 This end unit has a great private end location, view of trees and woods, and great location near the entrance to the tract. 2 Bedrooms, 1 1/2 Baths, 2 story, and one car garage with direct access plus an enclosed carport which can be for a car or patio. New carpet and inside of unit and garage has been repainted. Upstairs has laminate flooring in living room, dining room & powder bath. Storage closet outside and extra closets downstairs near bedrooms. Security screen on front door, large deck off living & dining room, with sliders from both rooms. New microwave, mirrored wardrobes, patio outside master bedroom, upgraded marble vanity & travertine flooring & shower surround in downstairs bathroom. Powder room has laminate flooring and a pedestal sink. No Mello-Roos and easy to show.